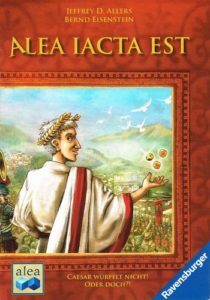 Players take on the role of Caesar and compete for the most prestige points. This happens by clever placement of his/her eight dice, which are placed on five different buildings. At the Castrum (barracks), new provinces can be conquered, while patricians can be recruited at the Forum Romanum to be sent to those provinces. At the Senatus, cards can be won for bonuses that will be kept secret until the end of the game. The Templum awards prestige points directly from the Goddess Fortuna. Each die that does not win any of these ends the round at the Latrina, where it provides its owner with a “repete!” chip, which can be used to re-roll dice or can be traded in two-to-one for prestige points at the end of the game. Each building has special rules as to how the dice can be placed, allowing many tactical possibilities with any roll of the dice. Each round ends when one player has placed his/her last die, and after 5 rounds (6 rounds with 2-3 players), the patricians are organized in their provinces, the senate cards are revealed, and the scores are totaled. The player with the most prestige points wins! » English rules (101 KB). » Polish rules (3,84 MB). » Italian rules (187 KB). » Portugese rules (5,03 MB). » Chinese rules (5,03 MB).